We had an awesome weekend and my version of the perfect Saturday. Over time, we've somehow started to name Saturdays like the one we had this past weekend "Family Fun Day." The whole family loads up and we go to downtown Bentonville for some fun. I love it so much and have missed it while the cold, winter weather held us captive inside. It doesn't consist of much, but I love the quality time spent with my little family and I feel like it does everyone some good to be outdoors, exploring our little town. There's quite a few restaurants/food trucks in downtown Bentonville with outdoor dining. 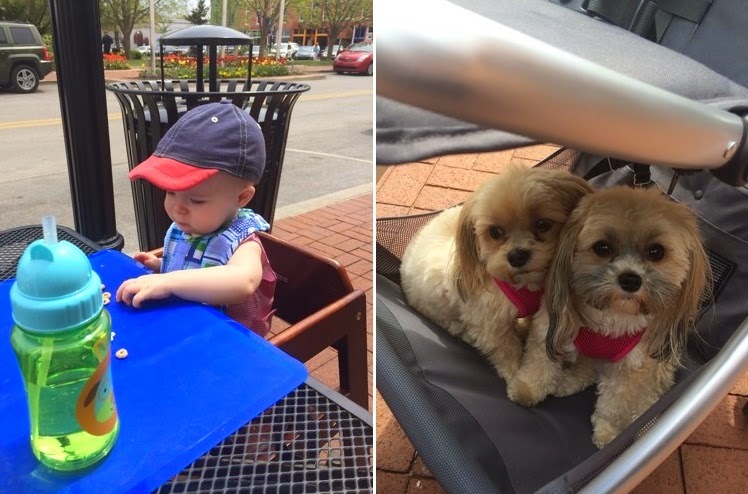 We have to eat outdoors because we always bring Ivy and Madison with us. They are such good girls and hang out in the bottom of Campbell's stroller while we eat lunch. They attract quite a lot of attention by passerby's and everyone wants to stop and pet them! After lunch we just walk around the square. Once we're done walking around the square, we hop in the car and drive a short distance to Crystal Bridges. It's not much but I absolutely love spending my Saturday's like this. Also, there are tulips everywhere you look right now and it's so beautiful!! I couldn't get enough of them. The Bentonville Farmers Market is opening the last weekend of April and I'm so looking forward to it. Whenever we have a free Saturday we love to go. It's so much fun and something we can all do together. I always load up on yummy local produce and beautifully grown flowers. It's just the perfect way to spend your Saturday's in the spring/summer if you ask me! Nothing is better than precious family time with the whole gang. It does this Momma's heart some good!